Donovan Phillips Leitch was born in Glasgow, Scotland, in 1946. As a child he contracted polio and was left with a limp. At the age of 14 he began to play the guitar and when he was 16 years old he set his artistic vision to bring poetry to popular culture. He began busking and learned traditional folk and blues guitar. Music critics began branding him as mimicking Bob Dylan’s folk style. Like Dylan, Donovan wore a leather jacket, the fisherman’s cap, had a harmonica cradle and a song with “Wind” in the title. Dylan wrote “Blowing In The Wind” and Donovan had a hit in 1965 titled “Catch The Wind”. Donovan was nicknamed by music critics in the UK as the “British Dylan.” In 1965 Bob Dylan flew to London for a concert tour of England in from April 28, to May 10, 1965. In a 1967 documentary titled Don’t Look Back, by D. A Pennebaker, Donovan appears with Dylan. In a concert performance of “Talkin’ World War Three Blues”, Dylan sings, “I looked in the closet – and there was Donovan.” During the film Dylan and Donovan each play some songs at a hotel party with a concert poster in the background headlined by Donovan, Unit Four Plus 2 and Wayne Fontana and Mindbenders. Dylan patronizes Donovan, while Donovan suggests “I can help you, man.” However, in the by the release of his second studio album, Fairytale, Donovan was forging new musical territory. “Sunny Goodge Street” featured some jazz elements and psychedelia. And Dylan bid farewell to acoustic guitar and picked up an electric guitar. 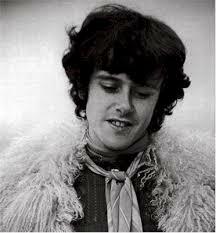 At the age of 19, Donovan quickly rose to fame in the United Kingdom in early 1965 with a series of live performances on the pop TV series, Ready, Steady, Go! In the winter of 1965-66, Donovan’s third album, Sunshine Superman, was mired in a legal dispute with Pye Records for over five months. When it was released in the summer of 1966 the title track drew from folk, jazz, pop, psychedelia and calypso. “Sunshine Superman” shot to #1 on Vancouver’s CKLG on August 27, 1966. The song, with it’s references to Superman and the Green Lantern, charted a new course in pop art. Donovan was listening to his own muse and music critics let go of the “British Bob Dylan” label. That same year Donovan provided the line “sky of blue and sea of green” in the Beatles song, “Yellow Submarine”. Donovan’s close association and friendship with the Beatles is seen in an unrecorded final verse of Donovan’s 1968 single, “Hurdy Gurdy Man”. George Harrison penned a final verse: “When the truth gets buried deep, beneath a thousand years of sleep, time demands a turn around, and once again the truth is found.” Donovan would later sing the Harrison verse in two of his live albums, Live in Japan: Spring Tour 1973 and Rising (1990). Donovan’s single releases were often more popular in Vancouver than in America. In 1965 “Colours” climbed to #29 in Vancouver but only #61 on the Billboard Hot 100. “Universal Soldier” climbed to #11 in Vancouver and #53 in America. “Epistle to Dippy” #11 in Vancouver and #19 on the Billboard charts. In 1967 “There Is A Mountain” reached #2 on CFUN and #11 on the Billboard Hot 100. A song that later became a lyric for a shampoo commercial, “Wear Your Love Like Heaven,” peaked at #5 in Vancouver, but only #23 on Billboard. In 1968 “Lalena” made it to #16 on CKLG but stalled at #33 on the Billboard Hot 100 and in 1969 “Barabajagal” climbed to #4 but barely made the Billboard Top 40, where it peaked at #36. “Jennifer Juniper” is another song Donovan wrote that had a superior chart run in Vancouver compared to national charts in the USA. It was written about Jenny Boyd, sister of Pattie Boyd, while they, Donovan and The Beatles were in Rishikesh, India. 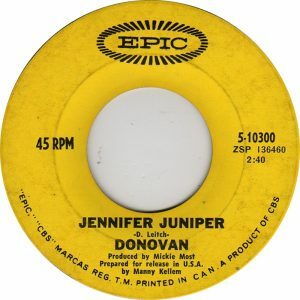 “Jennifer Juniper” is a song Donovan wrote, inspired by Jenny Boyd. She attended a Transcendental Meditation conference at a college campus in Bangor, Wales. Boyd was there with her sister, Patti, Mick Jagger, Cila Black, Marianne Faithfull and the Beatles. There were 300 participants at the August 26-28, 1967, training in Wales. In February and March of 1968, Jenny Boyd was with The Beatles, Donovan and others including Mike Love of The Beach Boys, and flautist, Paul Horn, taking further practices in TM. Jennifer was sitting very still, at least for the time she was learning about Transcendental Meditation. Jenny Boyd married Mick Fleetwood and was, at one time, the sister-in-law of George Harrison and, later, Eric Clapton. The narrator of “Jennifer Juniper” thinks Jennifer is pretty, that he likes her and could love her. He wonders what it would be like if she loved him. Photos of Jenny Boyd were featured as recently as November 2017 in the British online magazine, Purple Clover, on women who inspired romantic songs in the classic rock ‘n roll era. In the 2007 children’s fantasy film, Mr. Magorium’s Wonder Emporium, Natalie Portman plays “Jennifer Juniper” on the piano. Of Donovan next three singles, two concerned women: “Lalena” and “To Susan On The West Coast Waiting”. The Maharishi Mahesh Yogi, who Jenny Boyd, Donovan, George Harrison, Paul McCartney, John Lennon, Ringo Starr and others studied under in 1968, was born in 1908. The Maharishi taught Transcendental Meditation (TM) to thousands of people during a series of world tours from 1958 to 1965, expressing his teachings in spiritual and religious terms. In 1960, the Maharishi founded the International Meditation Society. In 1961 the Yogi began teaching courses in Rishikesh, India. TM became more popular in the 1960s and 1970s, as the Maharishi shifted to a more technical presentation, and his meditation technique was practiced by celebrities. Many Europeans, North Americans, Australians and others traveled to India to learn meditation at his ashram. The TM technique involves the use of a sound or mantra, and is practiced for 15–20 minutes twice per day. It is taught by certified teachers through a standard course of instruction, which costs a fee that varies by country. According to the Transcendental Meditation movement, it is a non-religious method for relaxation, stress reduction, and self-development. Donovan charted “Hurdy Gurdy Man” to #1 in 1968 and repeated that feat with “Atlantis”/”To Susan On The West Coast Waiting” the following year. In Vancouver, “Riki Tiki Tavi” was his last charting single, climbing to #9 on the CKVN charts in 1970. In 1971 he starred as the Pied Piper and wrote the music for the British film, The Pied Piper. In 1972 Donovan wrote the score for the Zefferelli film Brother Sun, Sister Moon. Over the course of his career Donovan has released 26 albums, though his tenth in 1973, Cosmic Wheels, was his last album to reach the Top 40. He appeared in the 1978 comedy musical film Sgt. Pepper’s Lonely Hearts Club Band. In 2005 he released his autobiography, The Hurdy Gurdy Man. D. A. Pennebaker, Don’t Look Back, 1967 documentary. Leitch, Donovan. The Hurdy Gurdy Man. Arrow Books, London, UK, 2005. Donovan: Bob Dylan, the Beatles, Buddha and Me, The Independent, London, UK, May 21, 2011. Roger Walsh & Shauna L. Shapiro, The Meeting of Meditative Disciplines and Western Psychology: A Mutually Enriching Dialogue, American Psychologist, American Psychological Association, 2006, 61 (3): 227–239.